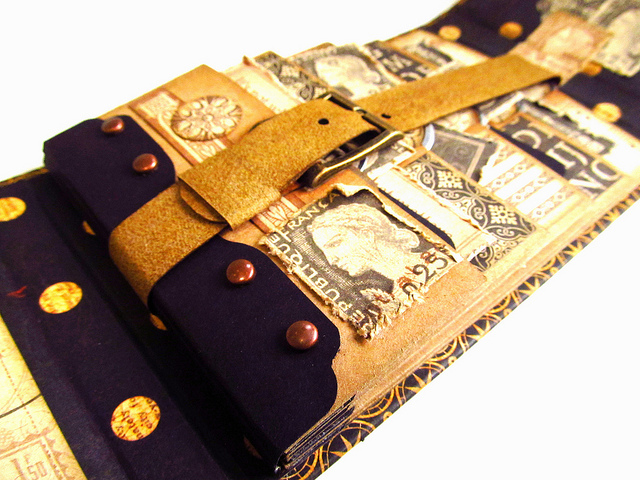 The Vintagey wallet is held closed by a latch that has been alcohol inked to match the beautiful paper from the Transatlantic collection. 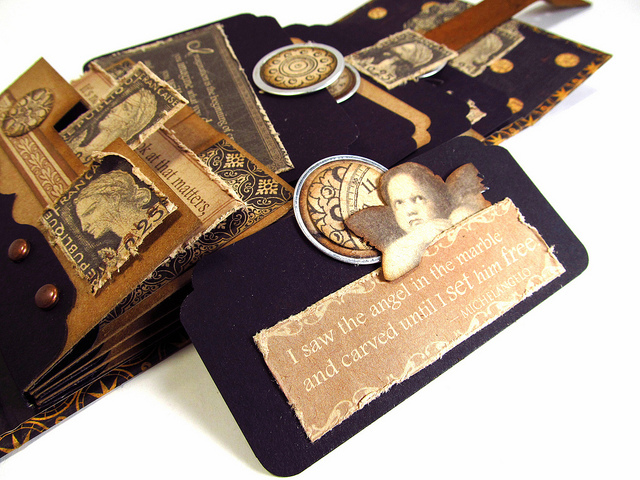 Chipboard Button staples have been added to the front for a dimensional effect. 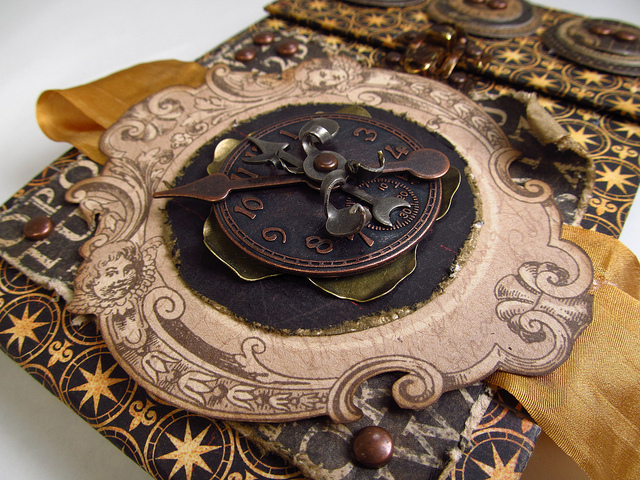 The front cover is layered with several papers from the collection and a timepiece added to the front for detail. 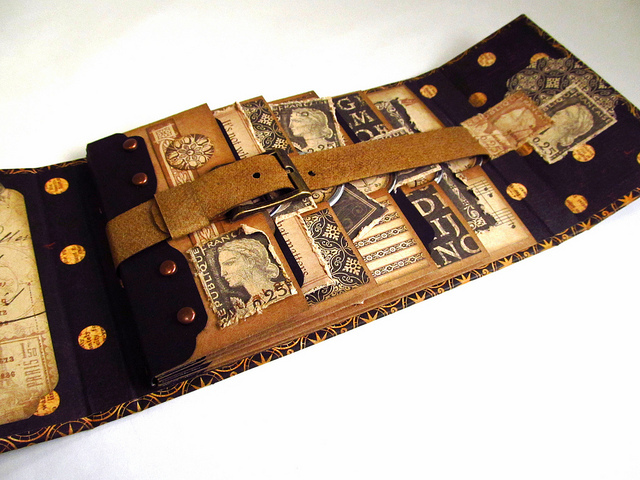 The wallet opens to reveal several sized pockets for pictures, tags and quotes and held in place by a strap and buckle. The tags are topped off with a distressed and Graphic 45 adorned key tag for easy removal. If you get a chance, please go by and visit my friend Nicole Eccles AMAZING Halloween Clock on the Graphic 45 blog as well. She Rocks Halloween! WOW It is absolutley gorgeous! Stunning! MINE. LOL. I love this. Is the reflections paper new? Fantastic Jim. I love it. The colors and textures are amazing. Love the paper on the cover. And you are right, Nicole rocks Halloween. Thank You for sharing. Jim Jim Jim, you are so bloody fantastic!! Where do you come up with all these wonderful creations?? Your mind must be spinning with idea's. Just brilliant, but how many times have I written the word "brilliant" in a comment on your blog?? You must be getting sick of it by now? I'd love to see this as a tutorial up for purchase on your etsy site sometime in the future. This is a fantastic project? Tutorial PLEASE! Wonderful Jim, do I see another tutorial here? I am at a loss for words. I love this project!! Did I say love? I mean LOVE!!! This project is beautiful! The paper looks soft like suede - I want to touch it. Thanks for sharing your great talent. I love it when you use my favorites!Perfect! Stunning piece! Love that G45 paper...is it new? Jim, this is another amazing example of your crafting skills...you really blow me away and i am always excited to see what you create and even what you say to go along with your reveals....thanks so much for sharing your passions with us. I love, love, love it Jim! The layering on the front is great, so many different textures. Fabulous!!!! I love this!!! I love the colors, the textures, the layers, everything about it. It...is...fabulous!!! Saw the clock and the wallet and swooned. Will there be a tutorial for sale for the wallet?? Hope so. A great vintage look on that piece Jim. Good work! Like it???? How about I LOVE this! I might as well just opened an ETSY account just for your corner of the world. It is awesome!! Jim, you are such a gift because you give me so many masculine ideas, and I feel like you've made a masterpiece out of those leftover papers we all have leftover that we can't part with! Jim...PLEASE give the people what they want...A TUTORIAL!!!!!!!!!!!!!!!!!! Once again great job what can I say that the prvious 22 admireers haven't said...one of the reasons I love this so much is I love quotes, I keep a book in my purse where I write them down when I find them so I won't forget. My favorite new quote is from the second Wall Street Movie where Gordon Gecko says, " I'll make you a deal, you stop telling lies about me and I won't tell the truth about you" Classic!!!! Thanks for inspiration. LOVE IT!!!! I NEED a place to store all the quotes I gather and this project would be perfect!! I love everything about the wallet!!!! How many times do you need to hear...tutorial please? LOL!!! The moment I saw this project I wanted it! 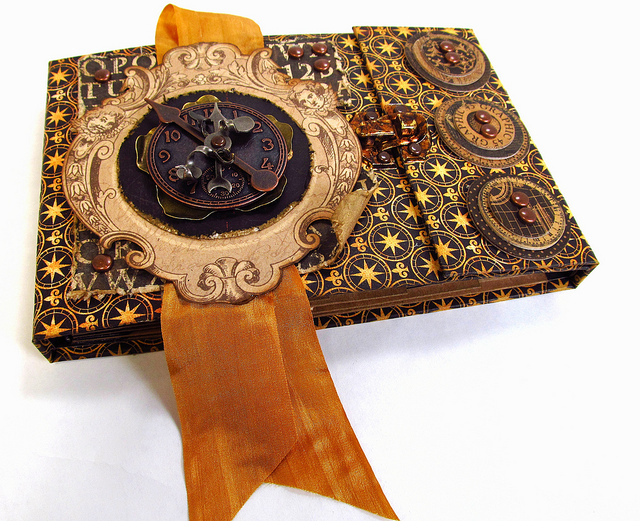 I wanted to hold it, touch all the wonderful embellishments and flip through it, taking in every design element. Beautiful job, GC! It is just too cool for words! Loved Nichol's clock too. Thanks for sharing! Jim, love this project, it has such a cool look to it. SPECTACULAR! I WANT ONE! I adore this piece. I agree with everyone else....a tutorial would be fantastic. I have'nt been crafting long at all & need all the help I can get! Anothrr fabulous work of art. This is phenomenal...just phenomenal. And I ditto the tutorial request. 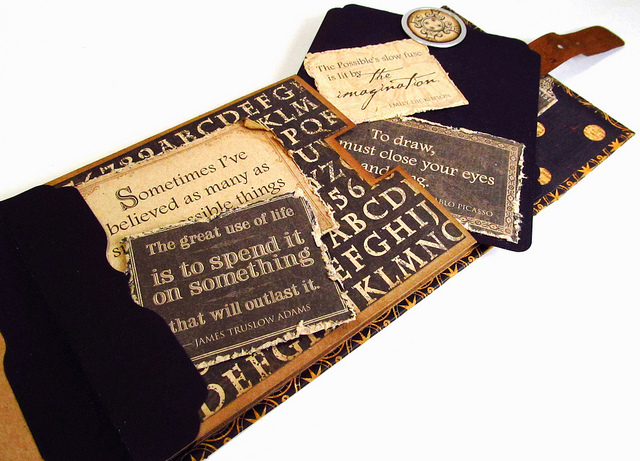 I love how interactive this is...and what a brilliant way to use all those fab quotes in Kraft Reflections. You sir, are a genius! A W E S O M E... you need to walk us through this one!!! Amazing, amazing, amazing!! Will there be a pattern or tutorial available soon?? I would LOVE to make this. Fabulous!! The inside is so original!! 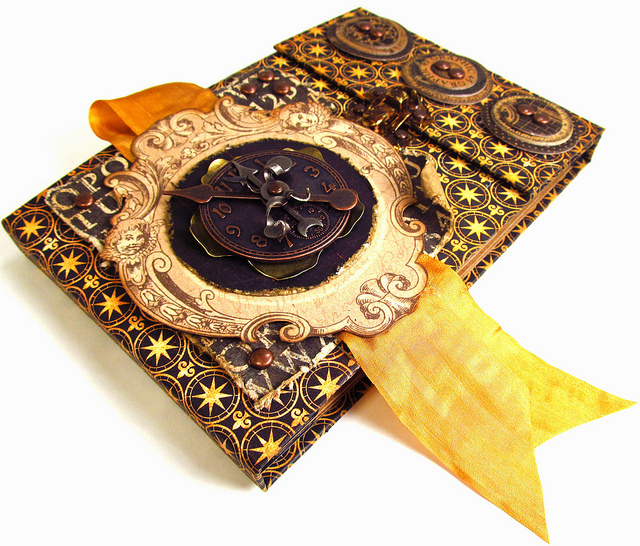 Gorgeous project. It would be the perfect gift for my granddaughter's Christmas... only, I can't find that paper! I noticed someone else had asked where it came from, as well. Spill the beans, Jim; where is this paper to be found...????? Another fabulous Jimbo project! You always manage to come up with something new and exciting all the time - please may I borrow your mojo for a while? !